AMSTERDAM, Netherlands (CelebrityAccess) — Amsterdam Dance Event, the world`s biggest festival and business conference for electronic music, has revealed the first additions to its line up for the 20th anniversary edition. The annual music festival will see 2,200 performing artists spread over 300 events at one hundred venues in Amsterdam. In 20 years ADE has become a global clubbing destination and an international platform for electronic music culture. Over 365,000 visitors are expected to visit Amsterdam for the event from 14-18 October. There are currently 500 artists confirmed, with more to be announced later in the year. &Me (DE), Adam Beyer (SE), Adriatique (CH), Agoria (FR), Alan Fitzpatrick (GB), Alesso (SE), Andhim (DE), Antal (NL), Anthony Parasole (US), Apollonia (FR), Armin van Buuren (NL), Art Department (CA), Axwell Ë Ingrosso (SE), Black Coffee (ZA), Bonobo (GB), Boris Werner (NL), Carl Cox (GB), Cassy (AT), Cleavage (NL), Chris Liebing (DE), Cristian Varela (ES), Damian Lazarus (GB), Dauwd (GB), Dave Clarke (GB), David Guetta (FR), De Sluwe Vos (NL), Dimitri Vegas & Like Mike (BE), DJ Rush (US), DJ Sneak (CA), DJ Qu (US), Donato Dozzy (IT), Dubfire (US), Fernanda Martins (BR), Fort Romeau (GB), GE-OLOGY (US), George FitzGerald (GB), Green Velvet (US), Guti (AR), Happa (GB), Hardwell (NL), Henrik Schwarz (DE), Horse Meat Disco (gb), Hot Since 82 (UK), Hunee (DE), I-F (NL), Ici Sans Merci (NL), Ida Engberg (SE), Jeff Mills (US), Joran van Pol (NL), Joris Voorn (NL), Joseph Capriati (IT), Julian Jeweil (FR), Karmon (NL), Kate Boy (SE), Kollektiv Turmstrasse (DE), Kolombo (BE), Kraak & Smaak (NL), Len Faki (DE), Leon Vynehall (US), Levon Vincent (US), Maceo Plex (US), Machinedrum (US) and Malawi (NL). 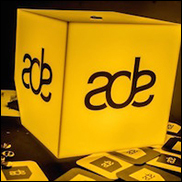 For a complete overview of all confirmed acts, visit ADE`s website.